This week is all about the EQ processing we tend to put on the master. 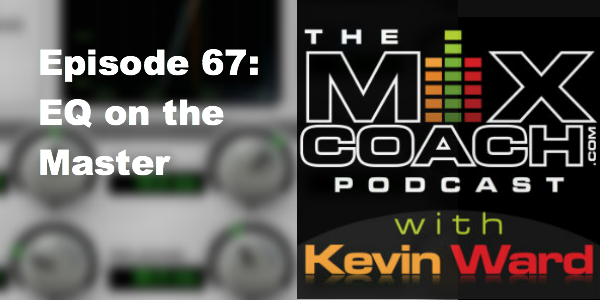 Kevin: This is the Mix Coach podcast, episode 67. Kevin: It’s not a smiley face. Kevin: Turn your phone off John [laughs]. John: All right hey Kev how’s it going? kind of like for you. Kevin: So what would my typical EQ curve look like? Kevin: Or like a two bus or an instrument [sounds like]. the rest of my mixes. Kevin: That looks like I did it. John: Yeah that looks like I did it. filter again, I use another filter on the low end. And i just make sure. And usually I’ll do this when I have a sub. usually the left hand of the curve will be a filter. A high pass filter. filter to where it has this bump. then it comes back down. low end. I forget. Do you remember what ozone calls that. John: I do not. Not off the top of my head. what it is but if you look on ozone and I think. . .
going above the line. And then typically there is a very wide curve. eight to ten K. . .
Kevin: Gives you some air. Kevin: And sometimes I’ll add a little shelf above that. John: So this goes up and then up just a tiny bit more? Kevin: What do you do? John: I mean as far as that goes I always kind of do the same thing. Kevin: So it’s the same curve . . .
John: It’s the same curve. . .
Kevin: But it’s below the line. John: But It’s below the line as opposed to above the line for sure. Kevin: That’s good yeah. I’ll have to try that some time. Kevin: That probably makes more sense. the mix. It’s definitely something that just always happens. more tips and even a free course, be sure and visit up at mixcoach.com. Question: What EQ processing do you use on your master?